Is Swearing Billy Show Too Rude For Your Children? The vibrancy, grit and sincere humour of the Billy Elliot movie completely won over my heart. Who can forget little Billy dancing around those northern streets to indie sounds of T-Rex and The Clash? Well don't expect any of that earthy, rock music in this musical razzle dazzle interpretation for stage. Sadly, the rock anthems have been replaced by new songs and "jazz hands" dance routines for the most part that don't fit in with the essence of the original. Billy Elliot the musical is riding on the coat tails of the film but has ripped out its soul. It doesn't help that there isn't a memorable song in the production and the cast hasn't been picked for their voices. The jokes are mainly based around the children swearing, which wears thin after a while. If you are a parent thinking of taking your child to see Billy Elliot over the Easter holidays, you should be aware that there is a huge amount of swearing. That's similar to the film, but while the movie was rated a 15, Birmingham Hippodrome has bizarrely reccommended this family show as suitable for children aged eight and over. 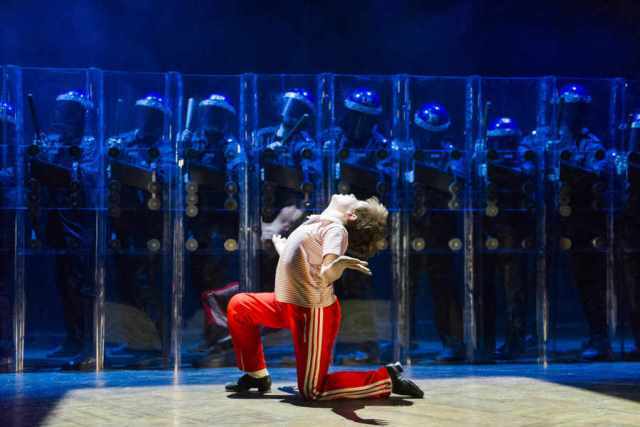 Billy Elliot the musical stopped off at Birmingham Hippodrome as part of its UK tour and stays there until April 29. It's not all bad and this is a big budget show that has won an array of awards. It follows ths well-known storyline of Billy's journey to becoming a professional ballet dancer amid a working man's culture of a mining town in the North East. Instead of boxing, motherless Billy is drawn to dance to the horror of his dad and older brother, who are on the picket lines during the miner's strike of 1984. Its saviour is that there are three excellent dance routines. The finale to the first act has an angry Billy tap dancing around stage, raging against the riot police, his mining family and being literally confined in a box rather than allowed to fly free to his ballet dream. Another stand-out scene is Billy's ballet dance with his older self to the music of Swan Lake. It's enchanting, simple and emotional as Billy floats on air in a similar vein to the dance routine in La La Land. His audition segment is also a joy and there is no questioning the talent of the young actor playing Billy. There are four rotating the role - Adam Abbou, Emile Gooding, Haydn May and Lewis Smallman - and the youngster I saw was excellent. My problem with this musical is that the relationships at the core of the story – Billy with his family, his dance teacher and his best friend Michael – are all overshadowed by big song and dance numbers that distract from the sentiment and human touch that made the film so strong. It wasn't until the final quarter of the show that the script really starts to make any impact. The segment towards the end where the miners are returning to work is beautifully choreographed. They disappear into the darkness with only their helmet lights shining out from the stage while singing Once We Were Kings, by far the best song of the show. Interestingly, the reason this well-loved film was transferred to stage at all is actually down to Elton John. Jon Finn, producer of the Billy Elliot film who has also closely worked on the stage version, said that he noticed someone sobbing through the Billy Elliot movie screening at Cannes in 2000 and when the lights came up, it was Elton. Finn said Elton was adamant he wanted to make a musical of the film and the rest is history, Elton even wrote the songs for the show, but they obviously aren't his best. There's no doubt the musical has been successful with audiences since its creation in 2005 and it is moving to see a talented child actor dance so well on stage, but in its own right, it would be average at best. I also wouldn't recommend taking younger children due to the high level of bad language. As a show associated with such an iconic, well-loved film, I feel it relies on the sentiment and attachment that people are bringing with them to the theatre. I was hugely disappointed as Billy Elliot the musical is pale in comparison to the movie. Tickets cost from £25 from the Birmingham Hippodrome website or by calling 0844 338 5000. Age Guidance 8 . No under 3s admitted.